Kendi rocking this floral moto like it's nobody's business. In my interview last week for Purely Fashion, I was asked "What trends are you excited to try this spring?" My response was: "I always think of that quote from The Devil Wears Prada, "Florals? For Spring? Groundbreaking" when I think of spring fashion, but not in a bad way! Especially after the hard, dark edge of the moto trend I've been sporting this year, I am looking forward to pretty florals and pastels for spring. And to be fair, I usually don't wear a lot of prints so florals are a newer thing for me!" Now, spring is nowhere close to being around the corner, but that doesn't mean that I can't start dreaming/integrating florals into my wardrobe now. I seem to be pinning a great number of floral pieces that will work now and in the spring and wanted to share them with you. Check them out! How about you all? 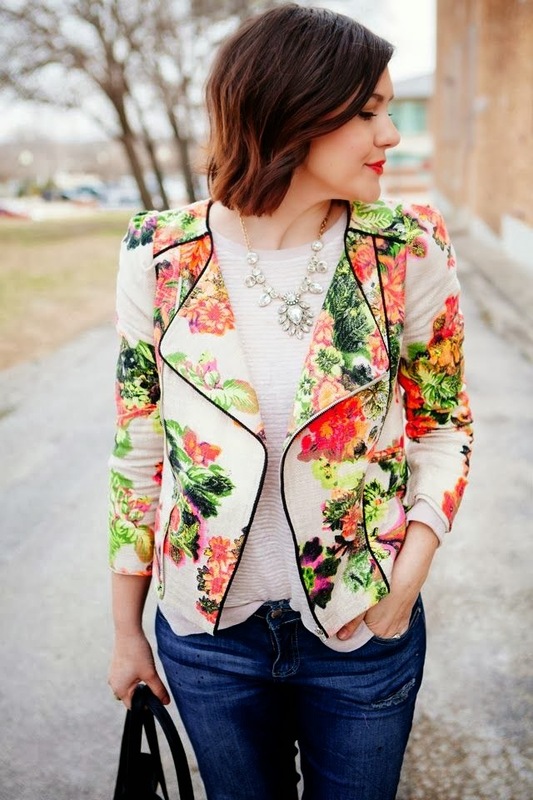 Are you ready for some fun floral numbers too?! I am loving all of these items for spring, esp. that moto jacket!! haha that quote is so hilarious.. but I really do love your floral picks! Especially those pumps! I just rewatched that movie this weekend .. so awesome lol! I'm loving the florals! That was a great movie and you showcased florals to the nines. Everyone involved in fashion and beauty should see it at least 5 times!